Before you can use a compatible ANT‍+ indoor trainer, you must mount your bike on the trainer and pair it with your device (Pairing Your ANT‍+® Indoor Trainer). You can use your device with an indoor trainer to simulate resistance while following a course, activity, or workout. 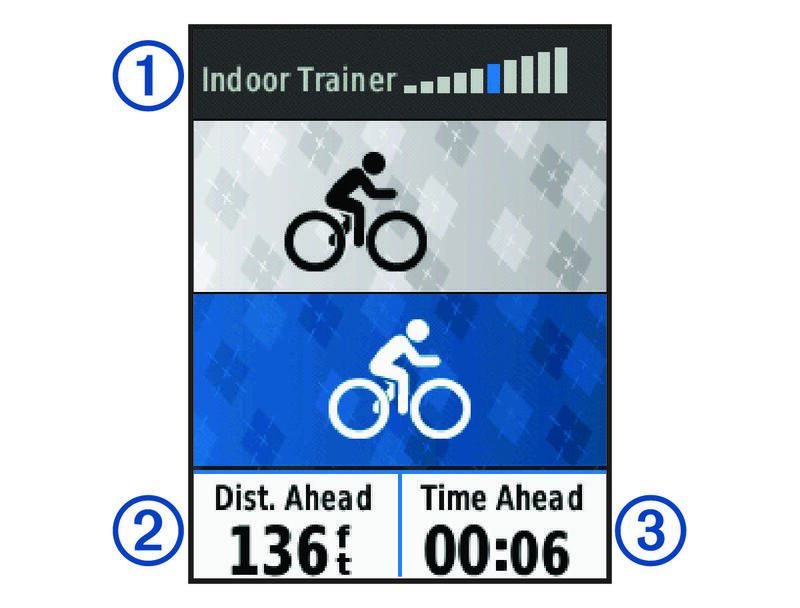 While using an indoor trainer, GPS is turned off automatically. Select Menu > Training > Indoor Trainer. Select Follow a Course to follow a saved course (Courses). Select Follow an Activity to follow a saved ride (Going for a Ride). Select Follow a Workout to follow a power-based workout downloaded from your Garmin Connect™ account (Workouts). Select a course, activity, or workout. Select to start the timer. The trainer increases or decreases resistance based on the elevation information in the course or ride. Select to view the trainer screen. You can view the level of resistance , your distance ahead of or behind , and your time ahead of or behind the distance and time originally recorded for the course or activity.